There is no question that Adventure Travel and Photography go hand-in-hand. What Adventure Rider doesn’t carry a camera to capture the amazing experiences and scenic landscapes they encounter on their rides? Photos make our travels even more memorable and allow us to share our experiences with family and friends. Personally, we love looking at adventure travel photos. Whether it is our own photos or the photos taken by fellow adventure riders, we can’t get enough of them. We have been using the Social Media service called Pinterest to post, share, categorize and organize our photos and photos we encounter on the Internet that inspire us. 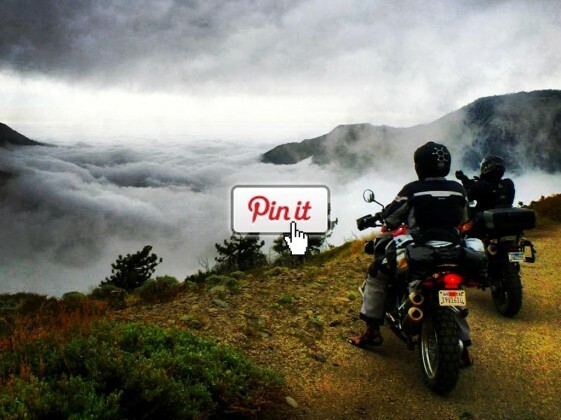 Well if you love photos of Adventure Motorcycles and the scenic landscapes, then you should definitely check out Pinterest. Pinterest has stormed to the top of the Social Media space as one of the fastest growing Internet companies in history. In just a few short years, Pinterest has grown to over 70 million unique users worldwide. At first glance, it seems like just a simple application for social bookmarking. But once you get started, your mind will be filled with all the exciting possibilities that Pinterest makes available to you. Pinterest allows you to express and share what you feel passionate about. When you come across Adventure Travel articles, photos or videos that inspire you, just add them to your Pinterest account with the “Pin It” button (we use the browser plug-in option). When you “follow” your friends and others with common interests, you also get exposed to new content you would have never discovered otherwise. The possibilities are endless and we must warn you that Pinterest can be a bit addicting. There is already a lot of great Adventure Motorcycle content on Pinterest to investigatem so get involved and share what matters to you. Let us know you are on Pinterest by following ADVPulse. We look forward to seeing all of your favorite adventure travel photos! If you would like to see what we are up to on Pinterest, here is one of our recent Pinterest Boards (a “board” is topic specific photo album). We created a Board with a theme of “Vintage Adventure Bikes” that includes images of all the early Adventure Bike models from the 80’s and 90’s. Leave us a comment on Pinterest and let us know if we forgot any models that should be included.